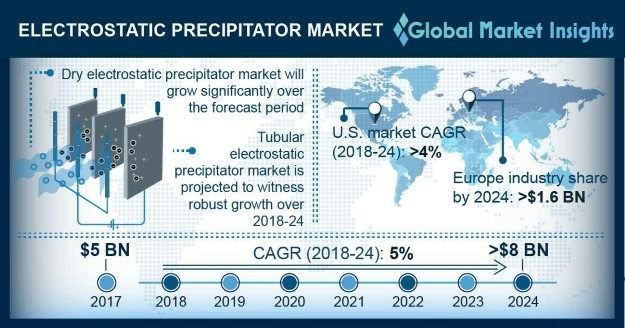 Electrostatic Precipitator Market size will surpass USD 8 billion by 2024, as reported in the latest study by Global Market Insights, Inc. Rising concerns pertaining to limit Sulphur and NOx emissions complemented by increasing stringency of international air emission standards will propel the electrostatic precipitator market growth. Upgradation and replacement of the existing ESPs on account of growing demand from the construction and power sector will further drive the industry landscape. The U.S. market will grow on account of abundant availability of mineral resources along with supportive regulatory framework toward air pollution control. Increasing mining activities owing to growing demand for precious metal will further stimulate the product adoption. Increased demand for electricity across the emerging economies owing to rapid urbanization and industrialization will stimulate the ESP market size. Implementation of emission reduction targets on account of growing concerns for reducing SO3 emissions will intensify their adoption across coal power stations. In March 2018, the overall coal based installed capacity was 197 GW, accounting for about 58% of the total installed capacity for power generation. Dry ESP market will witness an appreciable growth on account of limited capital cost and high filtration efficiency. The system’s ability to be used in integration with wet ESP’s and acid gas scrubbers to improve collection efficiency will increase the product adoption across various industries. Upgradations and developments in the existing ESP systems by various industry players will fuel the business growth. Rising measures to restrict harmful impacts of emissions contributed by shipping industry will foster electrostatic precipitator market growth. In addition, specific engine design standards along with adoption of policies aiming to limit the carbon footprint will foster the product penetration. In April 2018, IMO adopted initial emission control strategy with a target to limit total annual GHG emission by 50% by 2050 compared to the 2008 levels. The installation of ESPs across the cement industry will witness robust growth on account of increasing spending toward construction and renovation activities. These large-scale construction projects across the emerging economies will augment the global market size. As per the IEA, cement sector was the second largest industrial emitter in 2017 accounting for 6% of the global emissions. Increasing mining activities owing to growing demand for precious metals will positively impact the product demand. Supportive regulatory framework along with stringent measures to reduce industrial pollution are some of the key underlying factors accelerating the electrostatic precipitator market growth. Key industry participants in the electrostatic precipitator market include GEECO Enercon, Cottrell, Ducon Technologies, Sumitomo, Trion, Total Air Pollution Control, Blacke-Durr, Fujian Longking, Thermax, Babcock & Wilcox, Mitsubishi, Siemens, Mechatronics Systems amongst others.